← Did I Invite You to My (Winter) BBQ? Shakespeare said, “The sauce to meat is ceremony; Meeting were bare without it.” In Medieval times, sauces were more than ceremony, however. They were used to disguise the taste of food, much like perfume was used to hide someone’s odor. These days, sauces are meant to be the supporting actor: They ought to enhance food, not overpower it. For me, sauces are nostalgic: Hollandaise conjures up the Eggs-Benedict Christmas mornings of my childhood. And I’ll never forget the buttery polenta blanketed in Taleggio and wild mushrooms that my husband and I ate in a hillside town outside of Venice. I wouldn’t necessarily call myself sauce-challenged but many of my favorites—the artery-clogging, classic French sauces like béarnaise–have always eluded me. Making sauces like these require time, focus, and calm not characteristics I often possess at the dinner hour. As a result, we relegate sauces to special occasions. Day Six of the “Back To Basics” cooking class at the Cambridge School of Culinary Arts means to change all that. Instructor Steve Nill introduces “Sauces” with a history lesson. In the mid 1800s, French chef Antonin Careme systematized four mother sauces: espagnole, veloute, allemande and béchamel. In the early 1900s, another French chef, Auguste Escoffier, standardized and codified the cooking of the 19th century and affirmed the importance of these mother sauces. He classified the four as espagnole, veloute, béchamel, and tomato, and to a lesser degree, hollandaise and mayonnaise. Because our “Back to Basics” curriculum is based on classical French tradition, tomato-based sauces don’t make the cut. But Steve provides a great aside: according to legend, the French stayed away from tomatoes because they feared them and were convinced that they made you crazy. Tomatoes were finally deemed acceptable in the mid-1500s, when Catherine de Medici introduced them from Italy. After our history lesson, we head to the test kitchen to make these mother sauces and some of their derivatives, known as “small” sauces. My partner, Lauren, and I have been assigned the dessert portion of the meal: pears poached in red wine with crème anglaise and caramel. We start by peeling, coring and sanding the pears to give them a smooth look. The sanding, although laborious, is easy compared to the coring. No amount of stabbing, digging and twisting seems to get all of the seeds. My beautifully sanded pears end up looking like Swiss cheese. Not the challenge I expected in sauce class. Then it’s on to the caramel. We heat sugar and water with a few drops of lemon juice over medium heat until we get a dark amber color. We add butter, whisking until it melts. We take the pan off the heat, count aloud to three, then add the cream and whisk again. Easy. The crème anglaise, regrettably, is not as simple. There are many places to go wrong and we find them all. We whisk eggs yolks with sugar and a pinch of salt until the mixture is pale yellow and forms a ribbon (no ribbon–requires a re-do). We scald some milk, cool slightly and pour it in a steady stream over the egg yolk (requires a re-do–the milk is too hot). We place the mixture over heat, stirring constantly until it is smooth and coats the back of a wooden spoon. It should not boil (oops!) and the temperature should never exceed 180 degrees (oops again). After serious intervention by Steve’s assistant Dave, we finally arrive at a consistency, color and taste we can share with our classmates. We ladle the sauce on to a platter, arrange our pears on top and drizzle them with caramel. We then sit down to eat poached eggs with chipotle-orange hollandaise, salmon in a wine court bouillon, grilled tenderloin with sauce Robert, crispy almond squid with sauce gribiche, chicken supreme allemande, crisp potato cannelloni with zucchini and shrimp in béchamel and our pears. Despite their battle wounds, our pears are delicious; the crème anglaise is lap-it-up liquid gold. 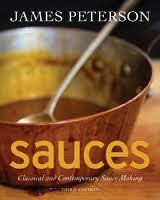 I head to my home kitchen, vowing to add more sauce to my repertoire. My crystal ball, aware that I’m sauce-challenged, remains skeptical.